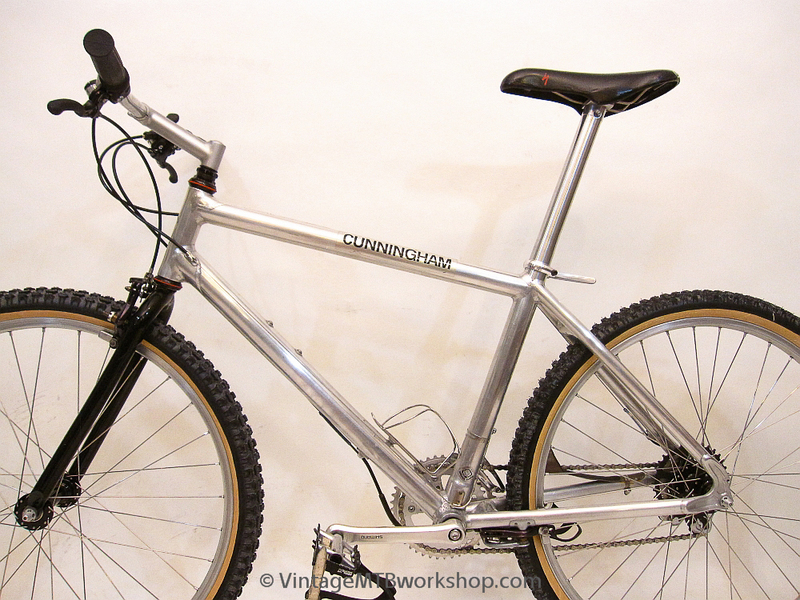 Charlie Cunningham built this Racer for himself back in 1989 as a replacement for his much revered #ZZ bike. 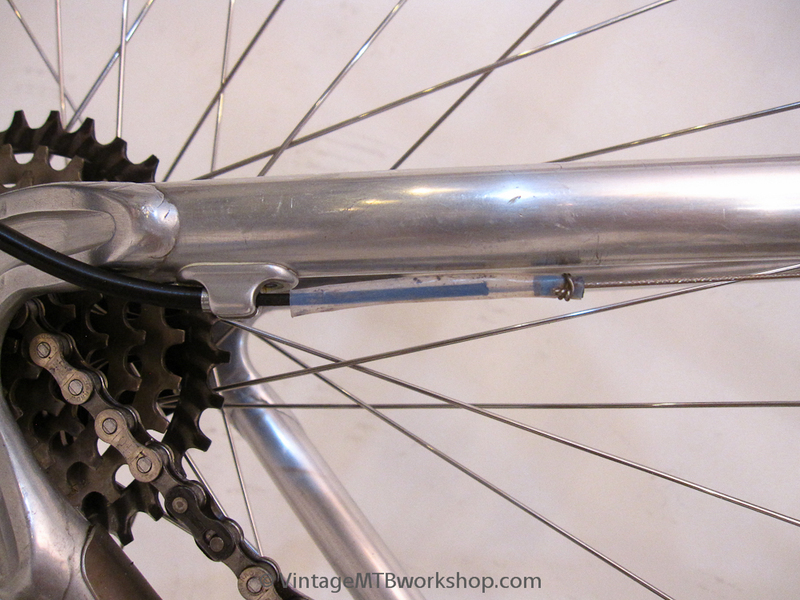 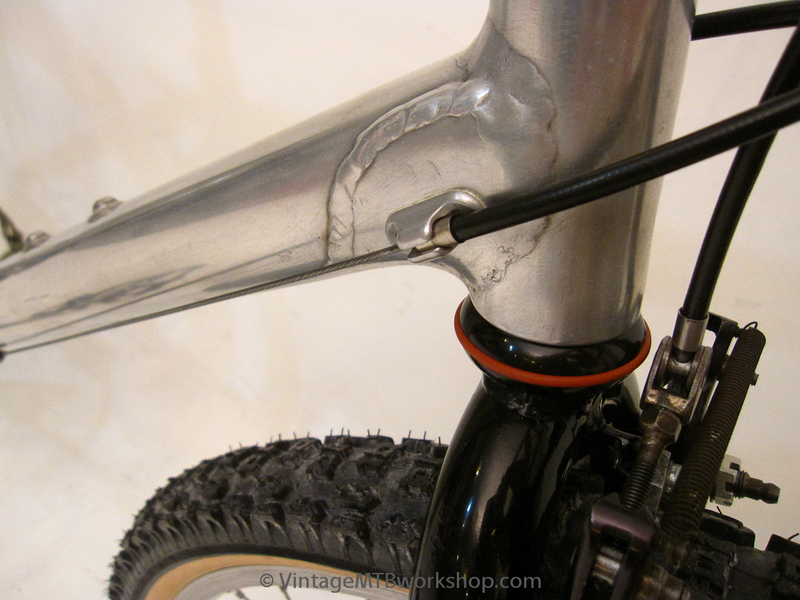 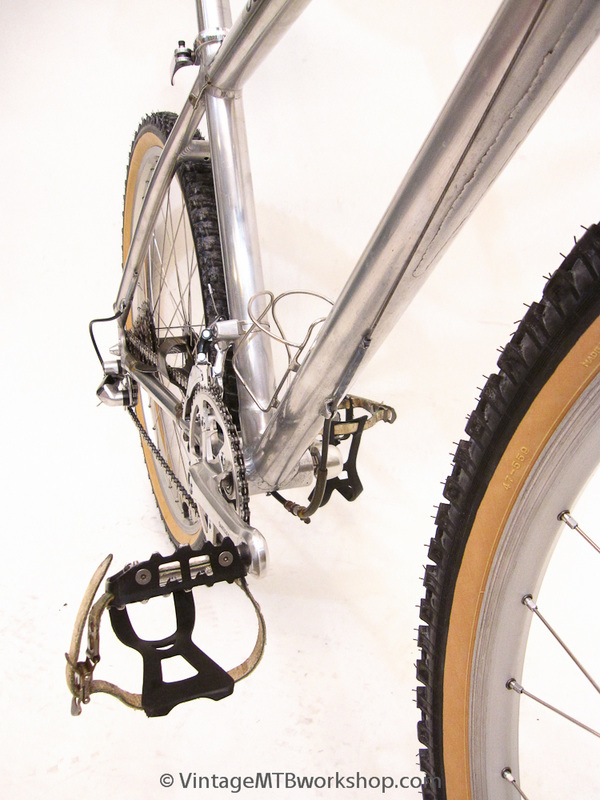 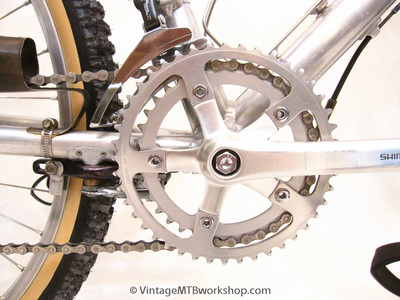 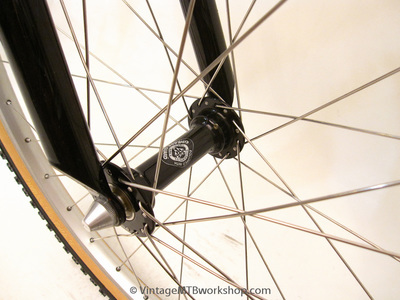 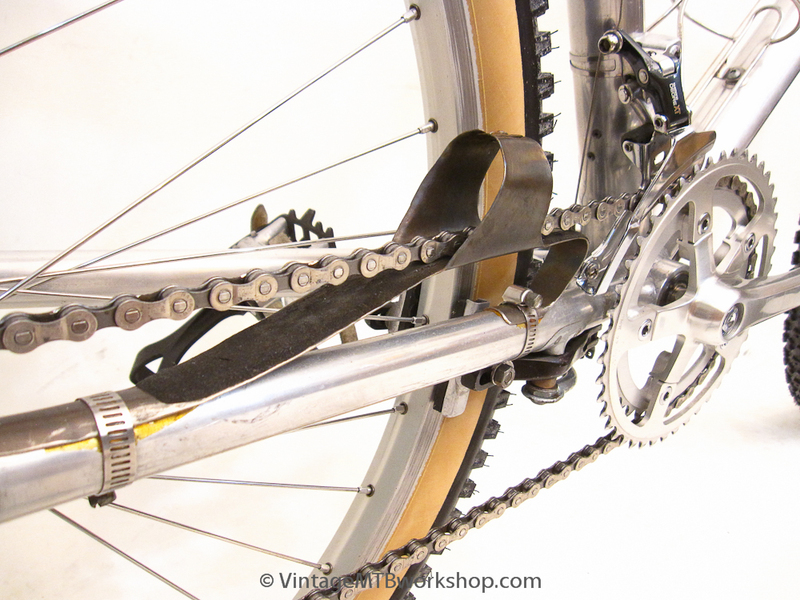 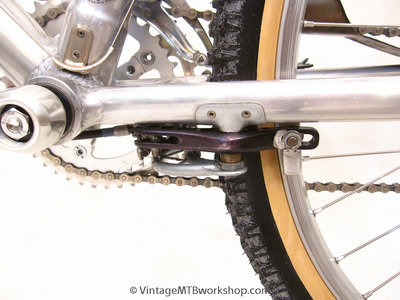 This bike is designed around a pair of Charlie's toggle brakes which he had made much earlier in about 1981 or 1982. 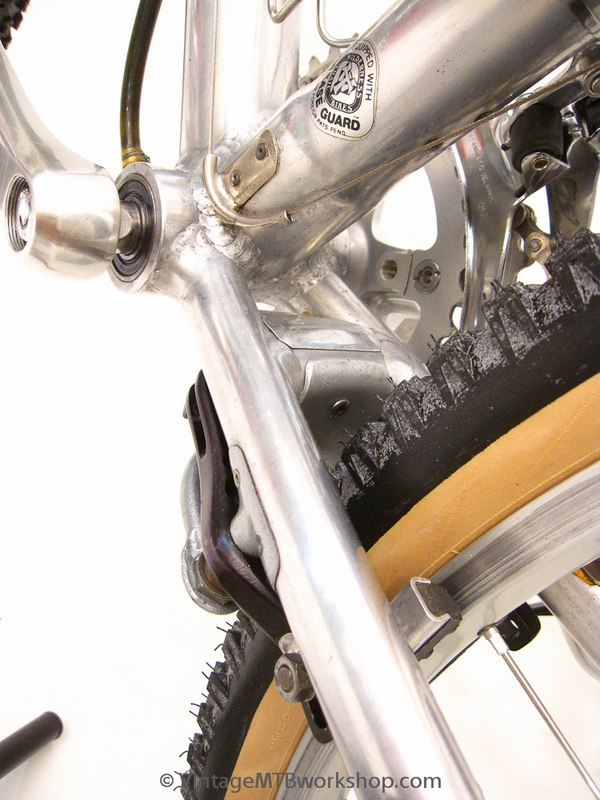 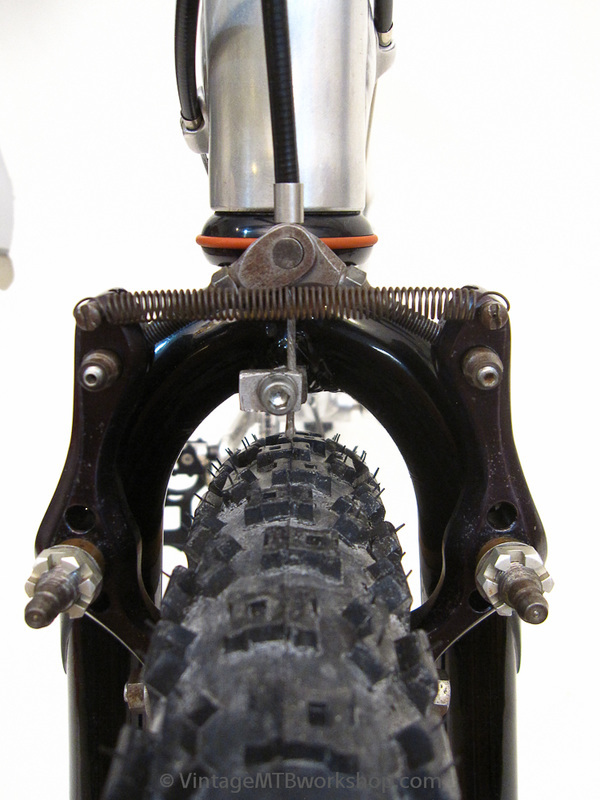 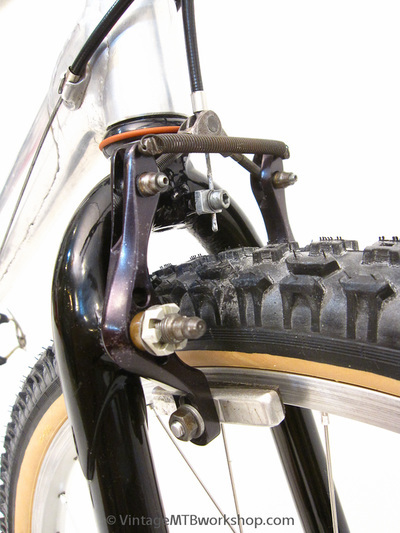 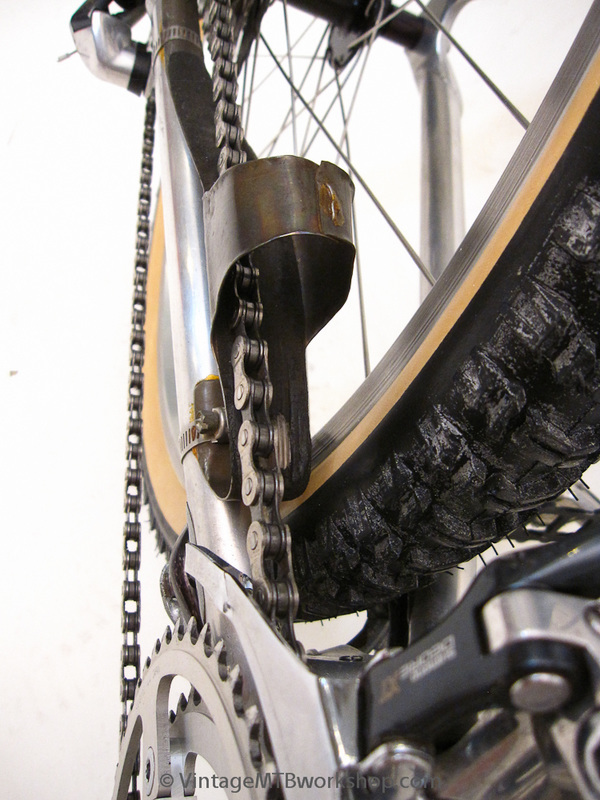 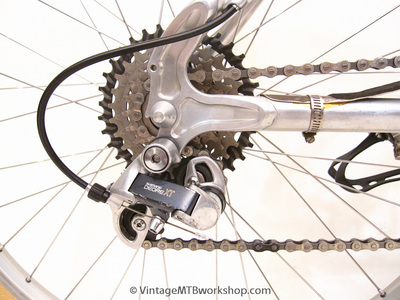 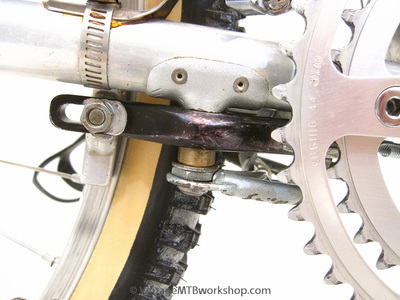 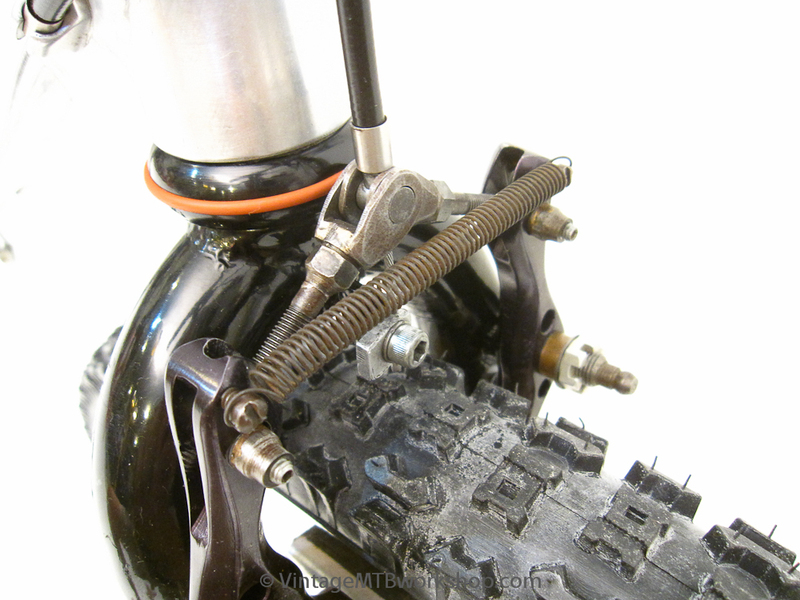 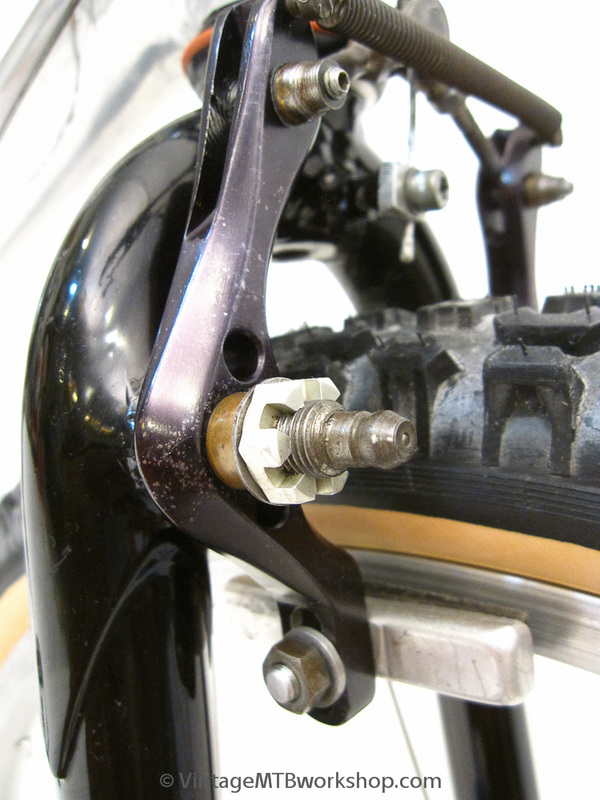 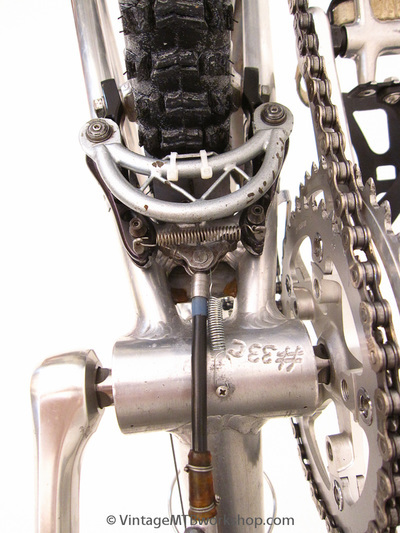 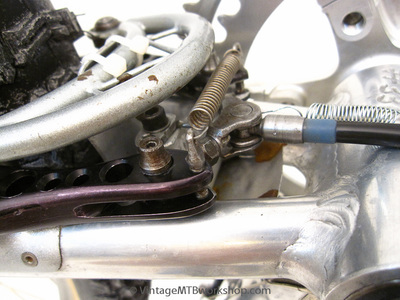 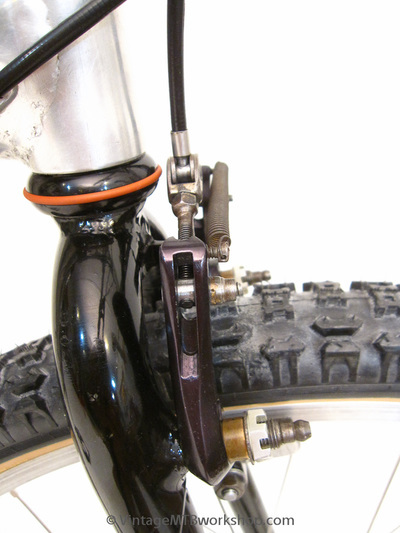 While the brakes offered superior power and control, the difficulty in setting them up properly and adjusting for pad wear made them impractical for customer bikes. 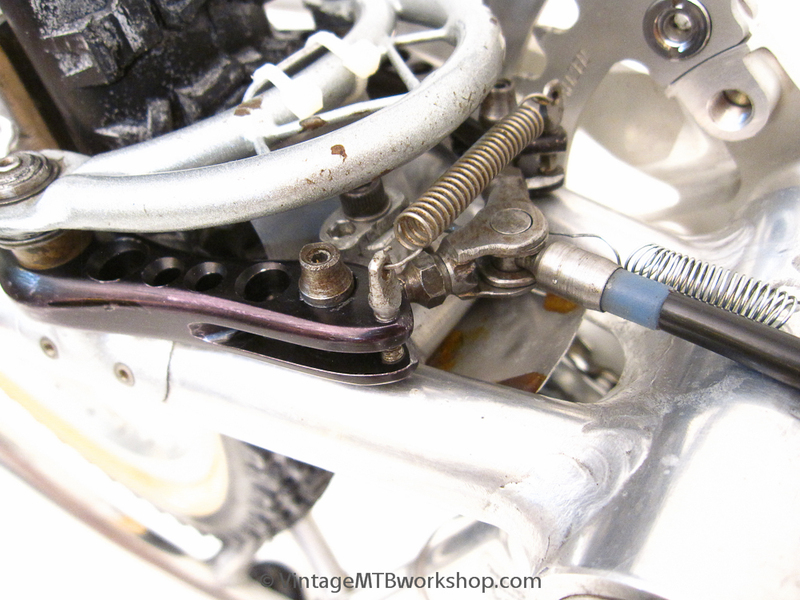 In addition, the amount of time required to make all of the intricate little pieces made them cost prohibitive as well. 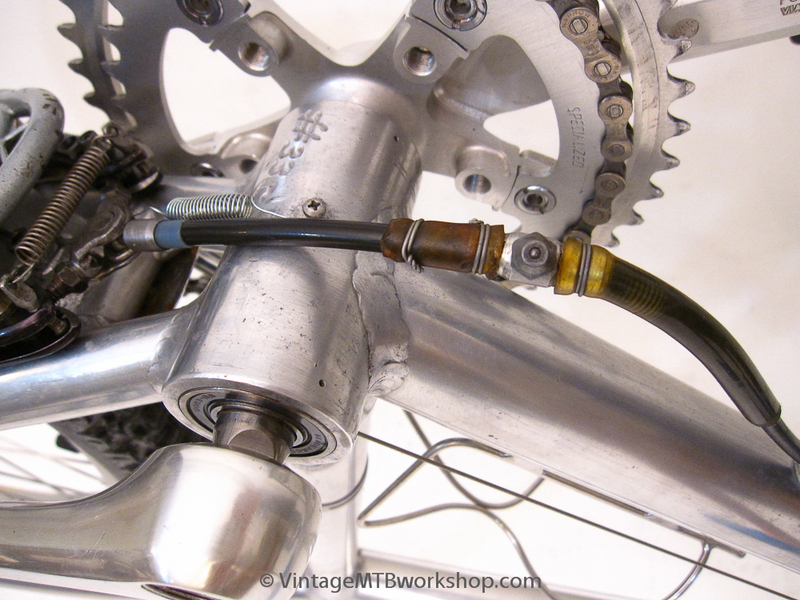 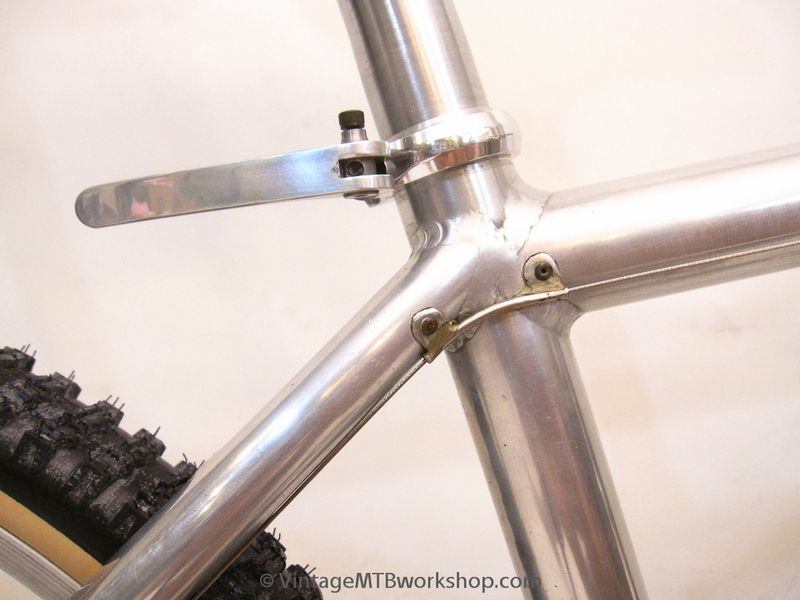 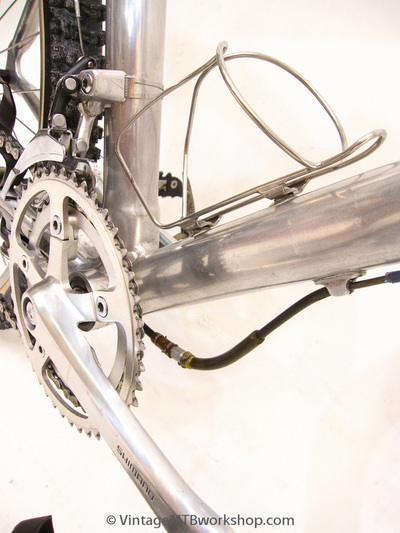 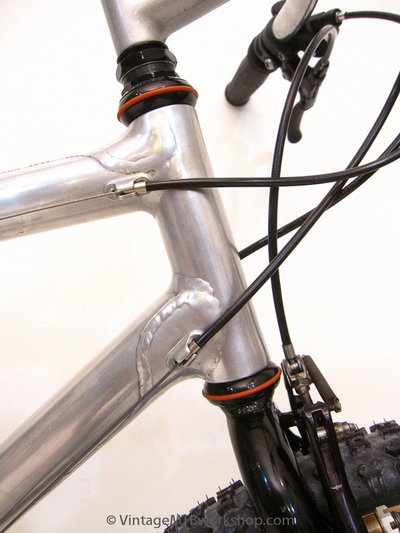 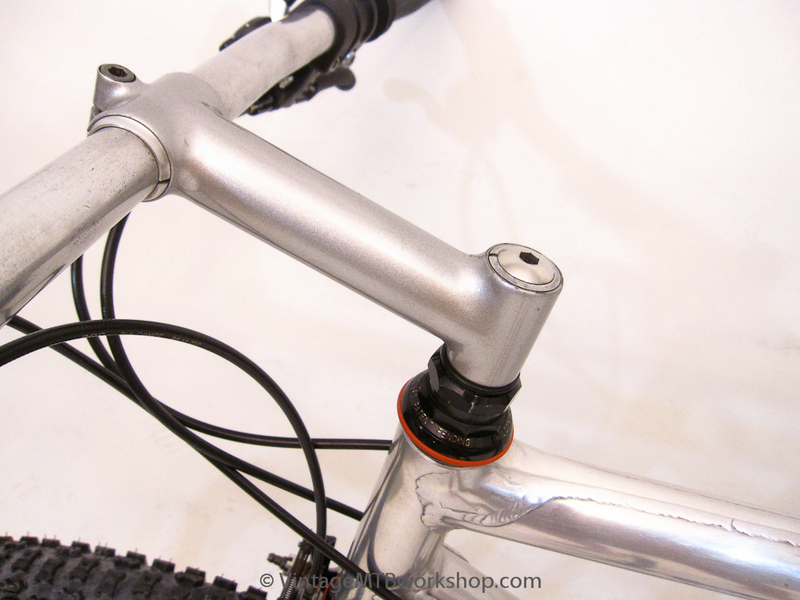 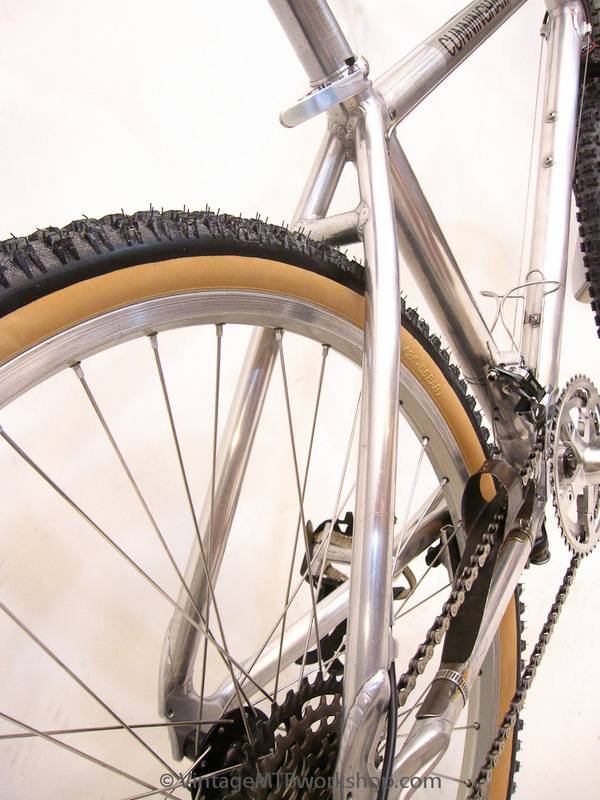 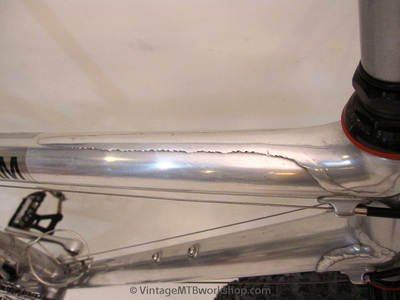 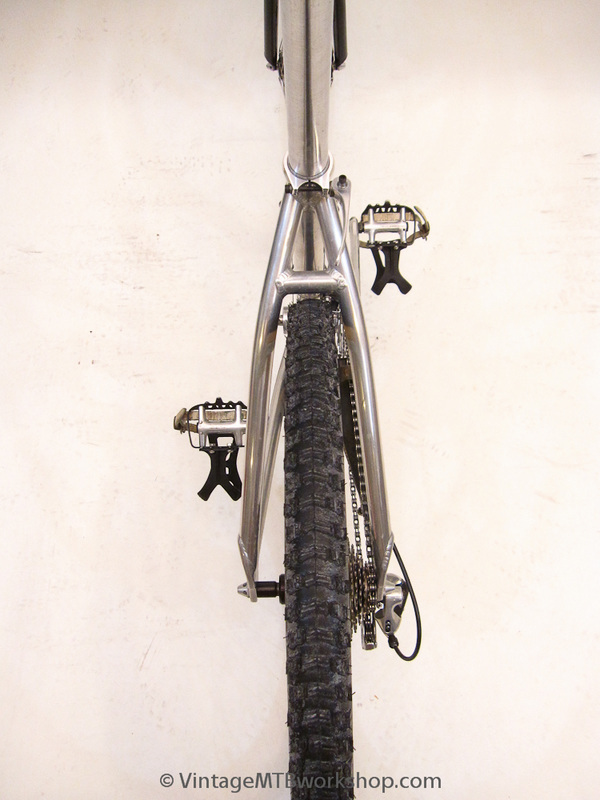 The bike also features and extra wide front hub with a 118 mm dropout spacing and a titanium chainguide. 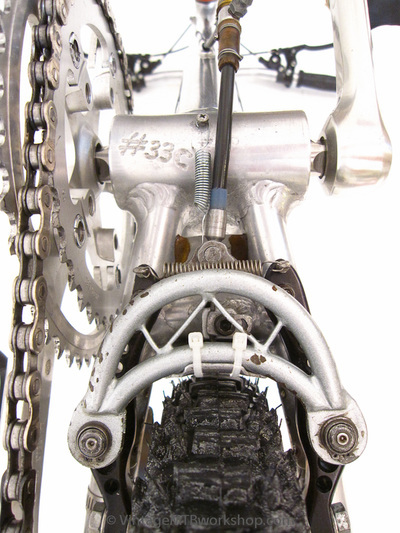 The bike runs double chainrings up front as Charlie had it configured originally, and a short cage rear derailleur that is just able to cover the custom 12 to 32 Dura Ace seven speed freewheel in the back. 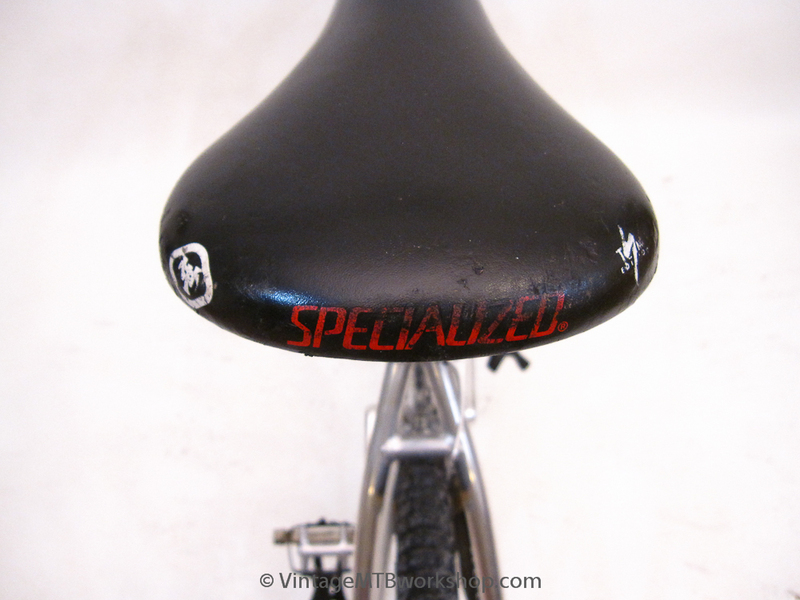 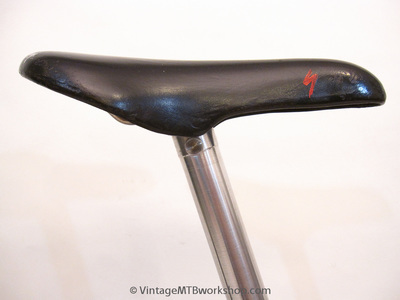 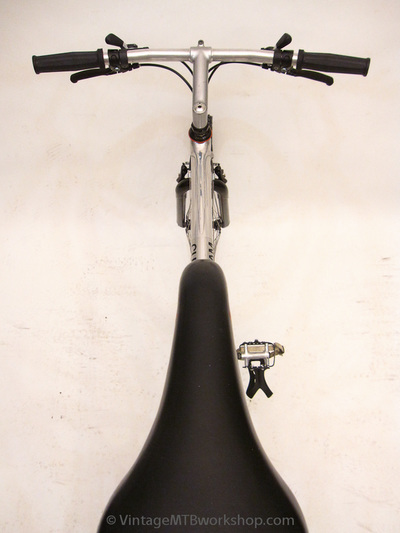 The saddle design was developed by WTB and marketed by Specialized, with branding from both companies printed on the back. 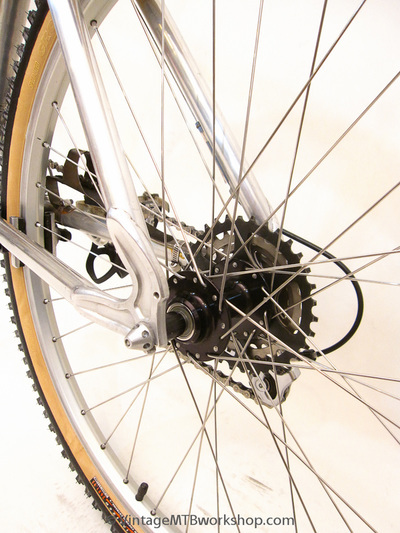 A couple years after the bike was built, the land access issues in Marin County for mountain bikes had resulted in legal action to ban bikes from many established riding areas. 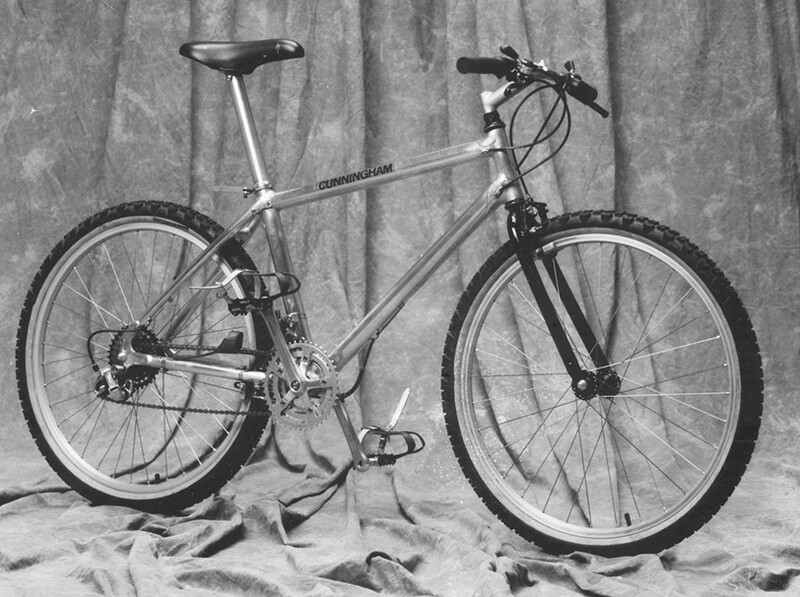 Charlie was a strong supporter of keeping trails open for everyone and brought the bike to the Interbike trade show with the intentions of selling it and using the proceeds to help with the legal expenses. 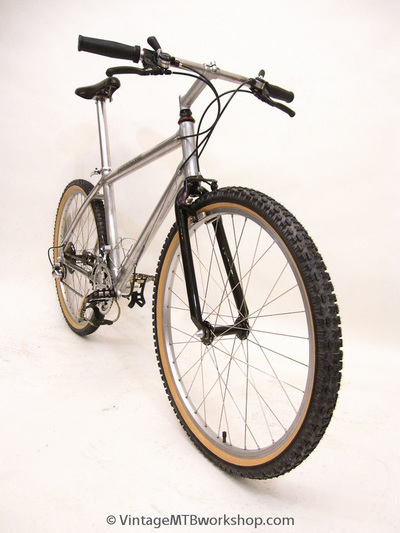 While someone committed to buying the bike during the show, the sale was never completed and the bike went on display for many years at American Cyclery in San Francisco. 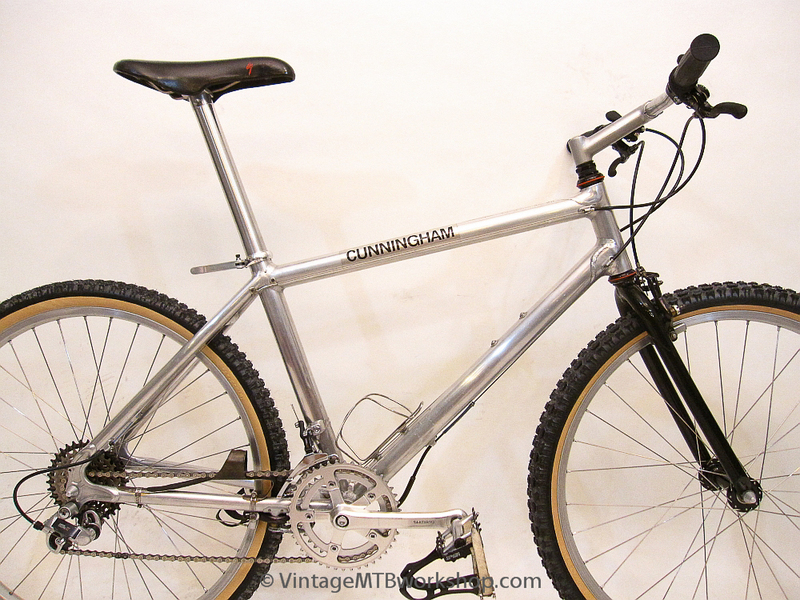 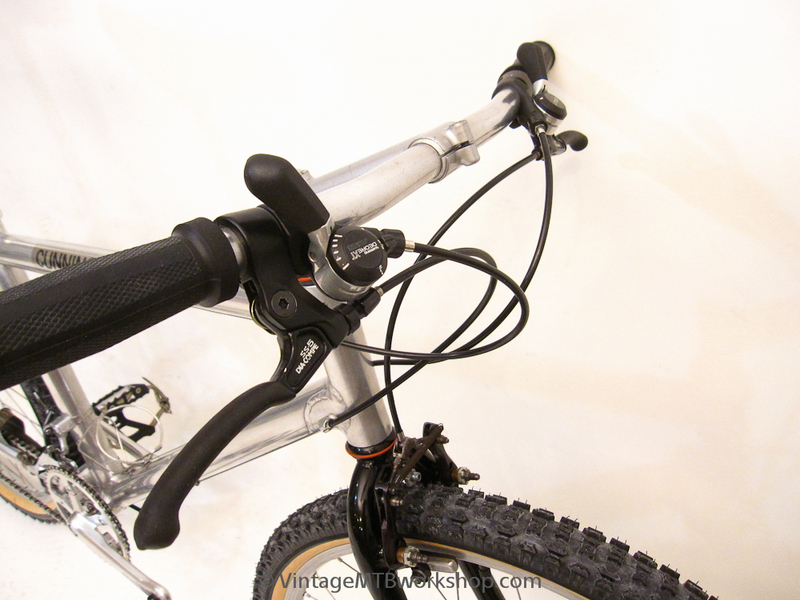 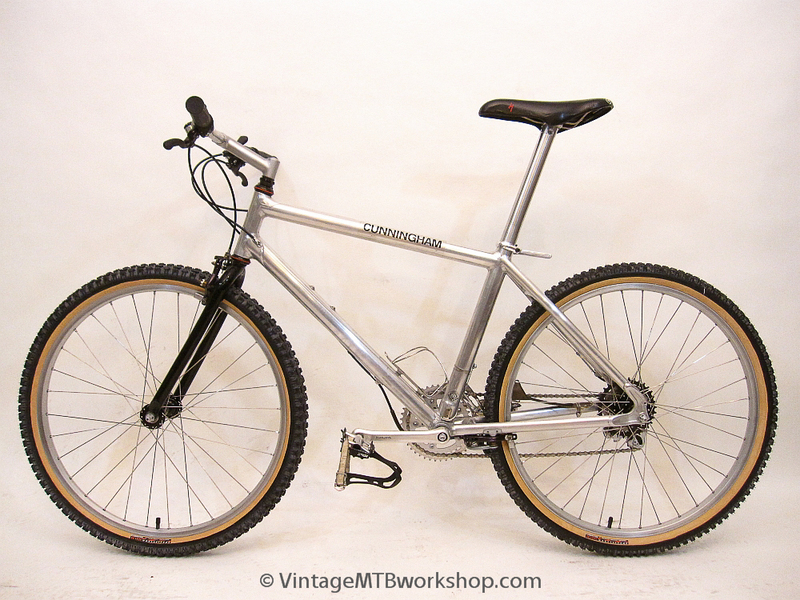 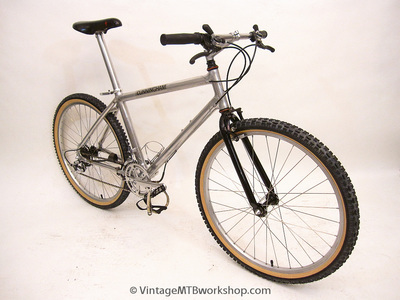 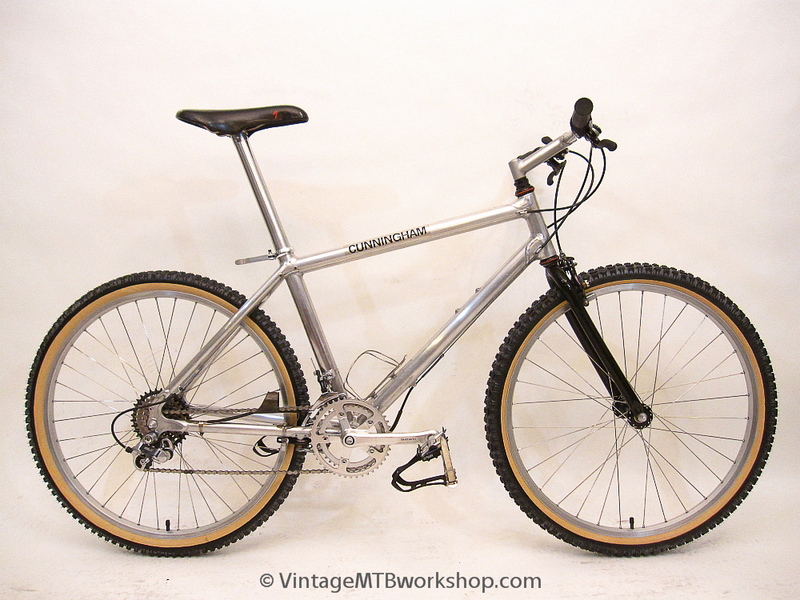 During that time the bike became well-known as the Land Access Cunningham, and eventually in 1998 was purchased by Steve Banks for his collection of historic mountain bikes. 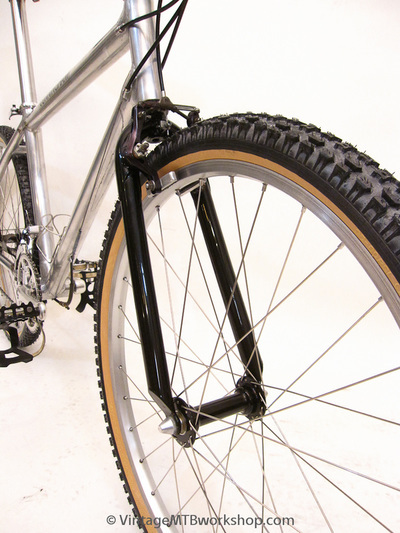 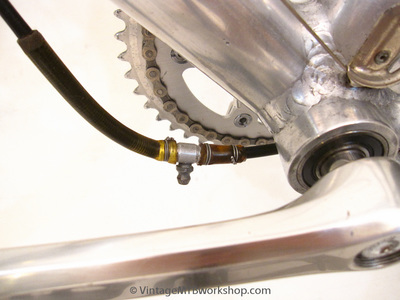 As a flat-bar Racer, it has many of the most desirable features found on Charlie's bikes.